3 Lighting Modes & 2 Levels Dimmable: Warm white,cool white,day light; 2-level brightness (dim/bright) switched by simply click of the in-line button . Flexible Gooseneck: Made of flexible alloy tube, which can bend and twist at any angle, maximize a wide range of 360° illumination, you can adjust the intensity and direction of light exactly as needed and let your neighbor sleep. Anti-skid Clip on Design: Made of Aluminum alloy, 68mm*158mm Piano paintthe Head, you can clip it to the desk,headboard,bookshelf, music stand, cabinet firmly and conveniently. 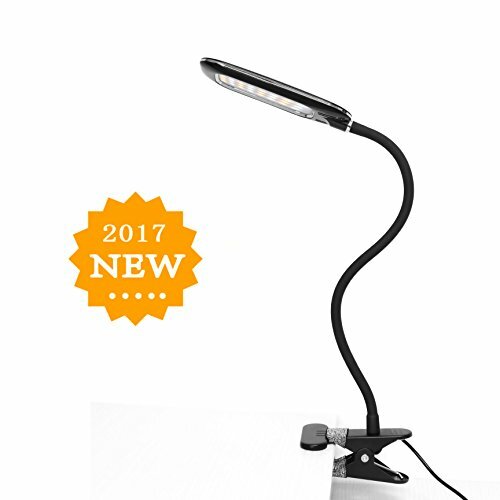 Safe and Eye Protection: Soft and natural LED reading light clip on, color temperature range from 3000-6500K, non-flickering, anti-glaring lighting effect for relieving fatigue, perfect gift for kids, child, students or book readers. USB Charging: The lamp is powered by USB port with Max 5V/1A input, you can connect it to a AC power adapter, PC Laptop or power bank, enjoy your reading anytime anywhere.